Psalm 67:36 professes: “God is wonderful in his saints; the God of Israel himself will give power and fortitude to his people.” Therefore, fortitude is a gift of God. Is Fortifying Fortitude An Exercise In Redundancy? The name of the virtue (and gift) of fortitude, derives from the Latin word fortis, “strength.” We see this in many familiar English words. A military stronghold is a called a fort, and if we want to strengthen something further, perhaps that fort or even our breakfast cereal, well, we’ll fortify it with planks and stones, or, in the latter case, with vitamins, in the hope that they will fortify us when we eat them. “Fortifying fortitude” then, means “strengthening strength,” but it is clearly not redundant when it comes to the Holy Spirit’s gift. St. Thomas was well aware that some theologians conflated the virtue and the gift, thinking they were but two names for one and the same thing. So, after addressing the virtue of fortitude with remarkable thoroughness in a full twelve articles in the Summa Theologica, he addresses in two additional articles the gift of fortitude and just how it differs from and fortifies the virtue. The natural virtue of fortitude is a “firmness of mind” that allows us to do the good and endure what is evil, especially when our actions involve things that are arduous or difficult. Man does possess the capacity to exercise such firmness, both in accomplishing arduous goods and in enduring “grievous evil,” and this is the stuff of the virtue of fortitude. The gift of fortitude, however, through the guidance of the Holy Spirit, allows man not only to struggle to achieve his ends despite difficulties, but actually to achieve his final end. Through virtuous acts of fortitude, perhaps to defend one’s loved ones or country, a person might well be thwarted by death, but through the Holy Spirit’s gift of fortitude, that person can overcome even death and achieve his ultimate end of everlasting life with God in heaven. Further, the gift can infuse within one’s mind “a certain confidence” that will dispel the most powerful fears, as we see in the cases of the holy martyrs, who cherish the gift of fortitude more than even their own bodies. Our opening quotation makes clear that St. Bonaventure concurs on the special significance of the gift of fortitude over and above the virtue. He starts his lecture on this gift by first describing it “from the perspective of the giver; second from the perspective of the recipient; and finally in terms of the work that comes from it.” Then he elaborates, as is characteristic of him, with a wealth of biblical citations and allusions. He expounds on the first point from the perspective of the giver with yet another set of threes: from the perspective of God as Giver, as Redeemer, and as the One who dwells within us. The gift of fortitude is given to us by God, who protects us. Citing Proverbs 18:10, Bonaventure notes: “The name of the Lord is a very strong tower. The just person runs to it and will be exalted.” God is the source of strength that he imputes to all things, and this strength is arranged hierarchically, so that God’s strength is also passed down to us through the Church He has established. The gift of fortitude is given to us as well “from God who redeems us through the incarnation of the divine Word. Isaiah 12:2–3 states: “The Lord . . . is my fortitude and my glory. The Lord has become my salvation. You will draw waters with joy from the fountains of the Savior.” He ends by noting that while Christ became weak for our sake, “the weakness of God is stronger than human beings” (see 1 Cor. 1:25). Are You Choosing Weakness Over Strength? This article is from Dr. Vost’s The Seven Gifts of the Holy Spirit. Click image to preview or order. Fortitude is the guardian of the virtues, and the gift of fortitude ratchets up the defenses to make them impenetrable when it is deployed. In what ways might we be sabotaging our own defenses? Aristotle, and St. Thomas following him, spoke of the moral virtues as “golden means,” dispositions to act in just the right manner, situated at just the right distance between the vices of deficiency on one side and the vices of excesses on the other. Fearfulness or moral weakness opposes fortitude as a deficiency, while a foolhardy fearlessness and reckless daring oppose fortitude as vices of excess. There are some souls so overblown with temerity that they distort the strength of fortitude by taking unnecessary risks, “jumping in where angels fear to tread,” and ignoring the wisdom of Sirach (13:2): “Do not lift a weight beyond your strength.” Far more common, though, is that vice of deficiency, the disposition toward timidity and fearfulness that may come to guide our actions (or lack thereof) when situations arise in which we should defend the Faith and stand up and speak out for what we know is right. Although this is not the place for a detailed examination of what St. Thomas called the “integral parts” of the virtue of fortitude, they bear a brief mention before we zoom in on the gift. In terms of the kinds of positive attitudes and actions that are required for the virtue of fortitude to flourish, we find the virtues of magnanimity, literally “greatness of soul,” that guides our thoughts and actions to great and not petty things, to things that truly matter and are truly honorable, even though they may be difficult to obtain. The magnanimous person seeks lofty goals and is not disturbed if others do not understand or approve, as long as he knows that what he’s seeking is morally right and consistent with the Faith. The other positive virtue aligned with fortitude is that of magnificence, the habitual tendency to try to make or build great things, even if this requires a great outlay of money, for example, in the construction of a church, a school, a hospital, a Catholic radio or TV station or network, or any grand, worthwhile project. Through fortitude we overcome undue fears of threats to our bodies and souls; through magnificence we overcome undue threats to our wallets! Recalling that the gift of fortitude perfects the natural virtue of fortitude, we might ask ourselves if we have given the gift a good base to build upon. Rather than growing in magnanimity, have we allowed ourselves to become overly influenced by our modern culture and mired in the pusillanimity, “smallness of soul,” that focuses too much on the petty things of the world? Or have we overshot the mark, falling prey to the kind of presumption, ambition, or vainglory through which we treat as great not the things of God but our own thoughts, desires, and thirst for fame or power? Rather than displaying magnificence and contributing generously to the needs of the Church, have we fallen prey to the vice of stinginess or meanness, contributing little to noble projects, while perhaps at the same time, displaying the vice of consumption, or waste, spending money extravagantly on things that don’t really matter, just to satisfy our whims or to build our reputations? Even more central to fortitude than these allied positive virtues that guide us toward the right actions are two virtues that perfect fortitude’s capacity to endure. The first allied virtue is the patience whereby we endure the sufferings produced by others or by events outside our control without giving in to sorrow and defeat and without lashing out inappropriately. The second allied virtue is the perseverance whereby we endure in virtuous thoughts and behaviors even when the going gets tough and stays tough, and when our attempts to achieve virtuous goals are met by obstacles and delays. In the grandest sense, perseverance comes into play as we try to persevere in the practice of our Faith throughout our lifetime, for as St. Matthew tells us, “He who endures to the end will be saved” (Matt.24:13). So we might ask ourselves if we have built up or undermined our capacities to endure in fortitude. Rather than growing in patience in dealing with a difficult situation or a difficult person, have we demonstrated instead impatience by lashing out at the person or perhaps by fleeing the situation, such as refusing to care for a loved one because of his abrasive words or actions toward us? Have we demonstrated resignation by staying the course, but in a spirit of sadness or defeat? Have we overshot the golden mean of patience by an undue subservience, perhaps by actively seeking out and staying in abusive relationships, displaying what is sometimes called “doormat” behavior in modern parlance, allowing ourselves to be stepped on by others without a reasonable word of complaint? Have we displayed what we might call “pseudo-martyrdom” by willfully seeking out such relationships with others that produce obstacles to our own good, and then complaining of the pains we must endure to all who will hear us? Clearly there are many questions we might ask ourselves as to how we might undermine the walls to our souls that are guarded by the virtue of fortitude, but what about the gift? Well, the gift builds upon the virtue, so all the same questions are still worth the asking. As for other obstacles contrary to the gift, I direct readers back to the story of Samson. Samson’s strength and courage were unmatched, but when he diverted his attention to worldly pleasures and dwelled on them in thought until they replaced God at the center of his heart, he unwit­tingly, in a sense, chose to forgo the Holy Spirit’s mighty gifts. Of course, even in his life we see the true merciful nature of the Holy Spirit as Love and Gift. For when Samson repented, those “seven locks” began to grow once again and God answered his prayer for new strength. The first prayer that comes to my mind when I think of the gift of fortitude is the simple oft-heard “Lord, give me strength!” In fact, there is nothing at all wrong with short, sweet prayers like that to call upon God at times when we face life’s difficulties and could use some instantaneous spiritual fortification. Sts. Thomas and Bonaventure concur that the petition in the Lord’s Prayer “Give us this day our daily bread” pertains to the gift of fortitude. Bonaventure explains that this is because bread “strengthens the human heart,” echoing Psalm 104:15, and Thomas chimes in that “this gift of fortitude prevents man’s heart from fainting through fear of lacking necessities, and makes him trust without wavering that God will provide him with whatever he needs. For this reason the Holy Spirit, the giver of this fortitude, teaches us to pray to God to give us this day our daily bread.” Theologians have long noted deeper meanings involving the bread in this petition, and Thomas explains that it also refers to the sacramental bread that is the Eucharist and to “the Word of God: ‘Not by bread alone doth man live but by every word that proceedeth from the mouth of God.’” Those words were spoken to Satan by Him who is “the living bread which came down from heaven” (John 6:51). When the devil tries our fortitude, we might both echo Christ’s words and heed His advice with hearty daily servings of the bread of Scripture! As for the fruits that fortitude fosters, St. Thomas suggests patience, which endures evils, and longanimity (perseverance), which holds up over long delays to accomplish worthwhile goods. What could be more difficult for a loving mother to bear than the torture and execution of her child, and how could she bear this without the Holy Spirit’s gift of fortitude? Fr. Formby recalls the example of Hagar, Abraham’s maid who bore him the child Ishmael. Hagar and Ishmael were sent away, and their water ran out as they wandered in the wilderness. Presuming her son would die, Hagar laid him under a bush and went a away about the distance of a bowshot, saying, “Let me not look upon the death of the child” (Gen. 21:16), but God intervened to save them. The Blessed Mother, on the contrary, was blessed with the fortitude to stand close by the Cross and witness with her eyes the suffering and death of her innocent Son because she knew it was His will and God’s plan. Perhaps her example of holy fortitude could help give us the strength to stand by and not flee from the sufferings of our loved ones as they approach the ends of their lives on earth. Of course, it was the ultimate act of fortitude to experience those physical sufferings that Mary observed, knowing as well that His Mother’s love and fortitude allowed her to be there for Him to the gruesome end of His earthly mission, despite all the sorrow she suffered. The human natural virtue of fortitude, as we have seen, has its limits. Christ prayed, “My Father, if it be possible, let this cup pass from me; nevertheless, not as I will, but as thou wilt” (Matt. 26:39), and yet through the Holy Spirit’s gift of unfailing fortitude, Christ drank the suffering of that cup dry, as His Father had willed, so that through His Passion, death, and Resurrection we would have the chance to persevere to the end and share in eternal bliss with the Holy Trinity and to say, like St. Paul, “I can do all things in him who strengthens me” (Phil. 4:13). 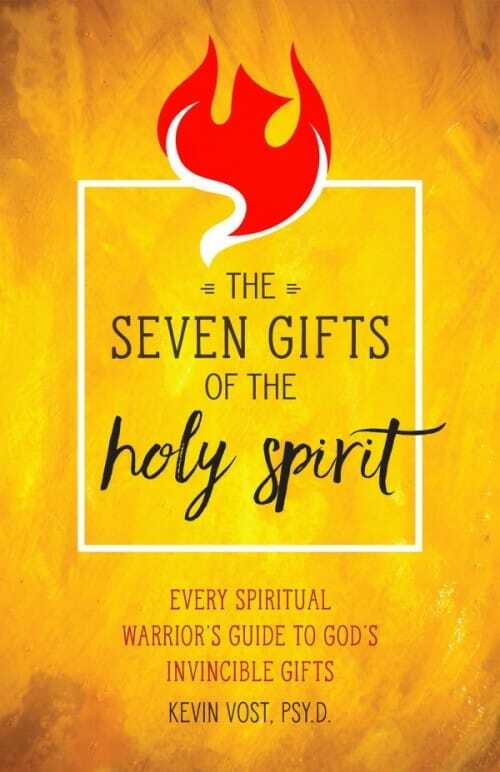 Editor’s note: This article is an excerpt from Dr. Vost’s The Seven Gifts of the Holy Spirit: Every Spiritual Warrior’s Guide to God’s Invincible Gifts, which is available as an ebook and paperback from Sophia Institute Press.